Mexican studio BNKR Arquitectura has recently created a sunset chapel in Acapulco, Mexico. 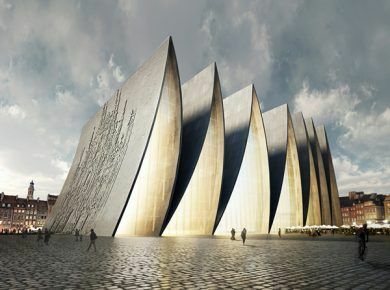 The project was designed to fulfill the client’s straightforward requests: the chapel is to take advantage of the picturesque views with the sun setting directly behind the altar cross, and the first phase of crypts are to be located outside adjacent to the building. The site, consisting of a densely forested landscape with a subterranean makeup of layered granite rock that occasionally surface and dot the topography with large boulders, incited a moral and practical approach to the form and construction of the project. The chapel, their second religious commission, serves the opposite purpose of their first, La Estancia wedding chapel, and as such the design derived from the conceptual juxtaposition of the two diametrically opposed projects. While the wedding chapel was translucent, light, and ethereal, the sunset chapel took on an opaque, solid, and permanent nature. In order to preserve the landscape the structure of cast-in-place concrete is anchored on a relatively small footprint, angling out through a faceted facade to occupy a larger space amid the tree canopies. A large boulder on site led BNKR Arquitectos to raise the altar five meter above grade to obtain the views without needing to damage the site. The large form itself mimics the look and nature of the granite rocks sitting one on top of the other so that it blends into the surroundings despite being an obviously man-made structure. A large cave-like opening on the largest face serves as the main entry leading into a large faceted room that transitions visitors from light to darkness before returning back to light again. A hanging staircase follows the irregular angles of the walls supported by slender steel cables. Once on the second level, the concrete walls adapt a new aesthetic. Rhythmic voids form thin columns that suggest a continuation of the outer envelope while allowing for 360-degree views around the main hall. terraced seating orients towards the altar at the far end of the structure enjoying the tallest floor-to-ceiling height. the back wall consists of a large opening capped in glass with aluminum mullions making a large cross in the center. in the distance, the sun setting over the ocean becomes a daily scene. And meanwhile be sure to check other cool buildings: Top 20 World’s Tallest Buildings.